Average Height	: 24" - 28"
Average Weight	: 60 - 80 lbs. Canyon State Doberman Rescue, Inc. This is a breed of relatively recent origin. It was developed in Germany in the 1860s, presumably by crossing among the old shorthaired shepherds, German Pinschers, Rottweilers, Beaucerons, Manchester Terriers and Greyhounds. The creator of this mixture was a German tax collector named Louis Dobermann. Dobermann had to travel frequently through bandit-infested areas, and decided to develop a watchdog and bodyguard capable of handling any situation that might arise. The breed is named after its originator (shortened by one n). The Doberman was first presented at a dog show in 1876. It was immediately a big success. The Doberman was first recognized by the AKC in 1908. Doberman Pinschers have many talents including tracking, watchdog, guarding, police work, military work, search and rescue, therapy work, competitive obedience and Schutzhund. •	Elegant and super athletic and active, Dobermans need and want lots of daily exercise. •	Super Intelligent, alert and loyal. •	Their fierce reputation precedes them ~ and feared by a reputation as being a highly aggressive and vicious. •	While being a formidable guardian Dobermans are actually really gentle, watchful and loving. •	They do not look for trouble, but will, like most dogs, try to protect their family and property. •	Dobies like to be part of the family and stay close to those they love. •	Good with children and other pets. •	Docking tail and ear cropping is not necessary and can be an adverse crippling, painful procedure and lifestyle for dobermans. •	Excellent pet and companion, great for families ~ a devoted family member. •	Dobermans are sensitive to cold weather and do not do well in cold climates with their short coats. •	Should not be left alone ~ prone to separation anxiety which can lead to destructiveness and barking and stress related bad behavior. •	A healthy breed at one time they used to have a shorter life span, but over the past 20 years they have gained longevity. Doberman Pinschers are energetic and alert dogs. They are typically fearless, and make great watchdogs; though they should never be vicious. They are very loyal to their owners, and overall, are very obedient dogs. They are sweet and loving with their families. The Doberman Pinscher has a reputation for being a fierce and vicious dog. In the past, these dogs have often been used as guard dogs and police dogs, and they have been stereotyped in the media, leading to this reputation. However, Dobermans will typically only attack if they feel that their family or property are truly in danger. In fact, according to the US Centers for Disease Control, Dobermans are less likely to be involved in attacks on humans than German Shepherd Dogs, Pit Bulls, Rottweilers, or Alaskan Malamutes. They have been used for guard and police work because of their size and strength. They were used extensively by the Marines during the Second World War. If your Doberman is properly trained to be a family dog you have absolutely nothing to fear from having this breed become part of your family. You'll find no more loyal dog breed and they are an effective watch dog, should you need one. They are great with children and with other pets in the home, but they should be introduced to them at an early age. Dobermans are extremely intelligent, and they're quick learners who are eager to please their owners. Dobermans vary in temperament more than many other breeds. Some are family oriented dogs while others bond predominantly to one person. Some have a tendency to be aggressive with other dogs, so they should be socialized with other dogs while they are puppies. Some Dobermans are very submissive, and males tend to be less dominant and stubborn than females. Still, because the dog is so intelligent and such an eager learner, with the right training, a Doberman of nearly any temperament can be a good family dog and a reliable, yet safe, watchdog. Wobbler's Syndrome is common in very large, fast growing dog breeds. Wobbler Syndrome causes the dog to wobble when they walk, particularly around the back end. They may also have difficulty with their front legs which may make them take short, choppy steps. If your dog has Wobbler Syndrome, your veterinarian may recommend kennel rest for a period of time and may prescribe pain medication as well as anti-inflammatory medications. Von Willebrand's disease is a genetic disorder that causes internal bleeding for which there is genetic testing available. Whenever you purchase a puppy, it's important to purchase from a reputable breeder. Reputable breeders will work hard to breed out deficiencies by not Breeding any dog that has shown signs of genetic or Health Problems. Breeders that are not reputable, however, will breed any dog, and are more likely to replicate genetic problems in their puppies. Before you purchase a puppy, ask questions about the lineage of the puppy. The Doberman Pinscher requires very little grooming. This is an active and athletic breed of dog. They do need sufficient exercise to be happy and healthy. They will love being your running or walking companion. They are also quite good at agility and other dog competition activities. These activities not only help the dog stay in shape, but also provide the needed mental challenge. The Doberman is a very intelligent breed, but they do need extensive training. They have a dominant personality and must be taught early on that you are the "alpha dog". In addition, due to their size and strength, it is imperative that their owners be able to handle them. They are assertive but not aggressive unless they are trained to be such. However, if they sense that you fear them or that you cannot show dominance over them, they are quite happy to be the dominant one in your household. 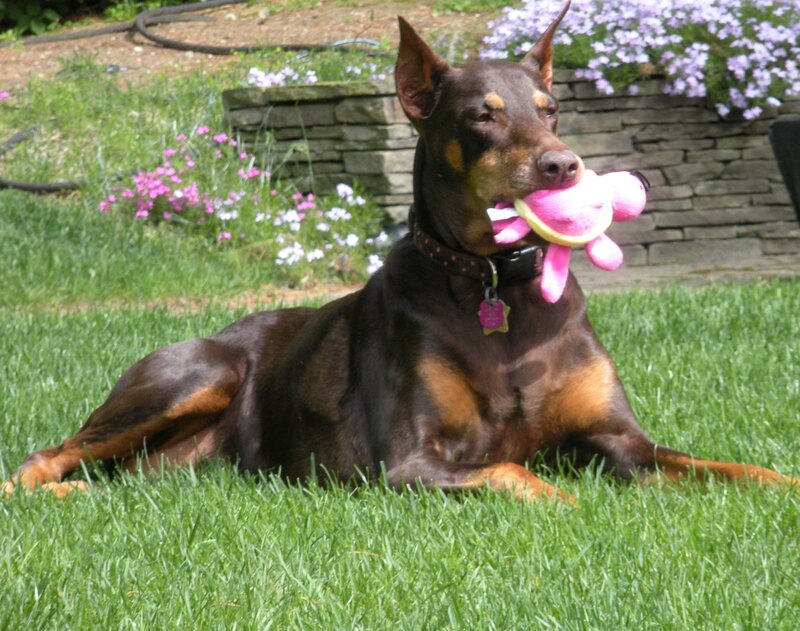 If you have other pets, it's likely that your Doberman will be the dominant animal in your home. They are energetic, and will be happiest if you give them regular opportunity to run off this energy. He should be thoroughly socialized at an early age so that he is comfortable around strangers. The Doberman does not need guard dog training. They are naturally loyal and protective of their families. Too much "guard dog training" may cause them to be overly dominant or aggressive. By nature they will be protective, but will not attack unless they truly believe there to be the need. This natural temperament is what you want to keep. Some owners run into training issues with Dobermans because they are afraid of them. It is imperative that every member of the family be taught to handle the dog with confidence, or the dog will become dominant. Training should be through positive reinforcement and should include the entire family. If you spend time with your Doberman and take the time to train him appropriately, you'll find no better family dog. They will want to be with the family and will require regular interaction. This is not a dog that can be relegated to living alone in the back yard.